Empty vegetable capsules consist of only two ingredients: HPMC and purified water. HPMC (Hydroxypropylmethylcellulose) is derived from vegetable cellulose. These capsules are 100% natural and contain no preservatives, gelatin, wheat, animal by-products or starch, and they are made from pure cellulose sourced from either pine or poplar. Capsules should be stored in a cool (58-79° F), dry place (humidity between 45% and 60%). Shelf life of the capsules is five years. Capsules are fast dissolving in the stomach and easily digestible. The empty capsules are manufactured in accordance with GMP and ISO 9002 regulations and are made without the addition of ethylene oxide or sulfites. All capsules are Kosher and Halal certified. All capsules are GMO free. All capsules are gluten-free and made without any preservatives. Do not fill empty vegetarian capsules or empty gelatin capsules with any liquid suspension because it will dissolve prior to consumption. Keep capsules out of direct sunlight, hot water, and high temperatures. 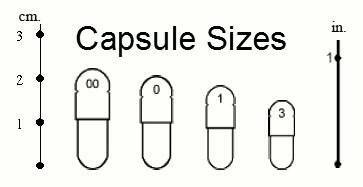 Capsule content depends on the density, concentration, and amount of the powder filled. Love these. I like to make my own mixes and this makes them go down so much easier.